Preparation and dosage: blend 1 or 2 teaspoonful of the leaf or root into 1 cup boiling water. Simmer 10 minutes. Drink 1-2 x daily. Tincture: take 1/2 teaspoon, 2 x daily. The name comfrey is derived from the Latin con ferva, "with strength." The genus name, Symphytum, derives from the Greek symphytis, "grown together," and phyton, "plant." Comfrey, a native of Europe and northern Asia, is a perennial that grows from 1 to 4 feet tall on an angular stem. It has large lanceolate or oval leaves which are about 12 inches long with a protruding midvein. The leaves get smaller as they get higher up the stem. Both the leaves and the stems are bristly. The bellshaped flowers grow in curled clusters and can be whitish, pink, or purplish. Comfrey is found growing in the wild in open woods, along streams, and in meadows. Once planted in a garden comfrey tends to take over and can be difficult to eradicate. Comfrey has been used as a healing herb for much of human history. It was carried by the armies of Alexander the Great to treat wounds and during the Middle Ages was used to treat fractures. 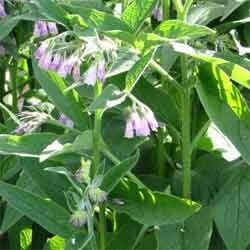 Comfrey moistens yin, heals irritated mucous membranes, and soothes and protects damaged tissues. It helps reduce pain, especially in the bones, tendons, and lungs. It is best known as an herb that can help regenerate cells. Today, comfrey tea is used to treat acne, arthritis, asthma, bronchitis, burns, cough, diarrhea, dysentery, eczema, fractures, gallstones, heartburn, hemorrhage, laryngitis, pneumonia, pleurisy, tonsillitis, tuberculosis, ulcers, underweight conditions, and whooping cough. Allantoin, a biogenic stimulator that is one of comfrey's important ingredients, is used in lotions to treat dry, rough, or wrinkled skin. Comfrey is also included in lotions, poultices, and salves to treat bruises, burns, carpal tunnel syndrome, eczema, fractures, hemorrhoids, scars, sunburn, swellings, wounds, wrinkles, and varicosities. As a poultice, comfrey helps draw out splinters and infection. As a bath herb, comfrey can soothe dry skin, and it can be added to shampoos and conditioners to treat dandruff and dry scalp. It can be used as a gargle for tonsillitis or made into a soothing douche or enema. Comfrey powder is used to brush the teeth and as a snuff for nosebleeds. The young comfrey leaves can be eaten raw, cooked, or juiced; since the plant is hairy, it needs to be finely chopped before being eaten. The roots can be candied. Comfrey baths were once given to women before marriage to restore the hymen and thus "virginity." The roots were once used as a dye plant, and the plant has long been used as animal fodder. When added to the compost bin comfrey accelerates the breakdown of organic matter. Comfrey is recommended only for short-term use of less than six weeks, and it is not recommended for use during pregnancy or while nursing. Some of its alkaloids are pyrrolizidine alkaloids, which may cause hepatic toxicity, specifically hepatic venoocclusive disease, in which the small and medium veins in the liver become obstructed. The root contains more of these potentially dangerous alkaloids than the leaves, and young leaves contain more than mature leaves. Prickly comfrey (S. asperum) has the highest levels of pyrrolizidine alkaloids of all species, while S. officinale has the lowest. Herbalists debate about the safety of using herbs containing pyrrolizidine alkaloids, and more research needs to be conducted to determine whether comfrey is safe for internal use. But there is no problem with using it topically. Because comfrey causes rapid wound healing, make sure a wound is clean of any dirt before applying comfrey. Also be sure of your species; poisonings have occurred from novices collecting toxic foxglove, mistaking it for comfrey.